Why buy Nutro cat food? Every Nutro cat food recipe contains only wholesome, natural ingredients with vitamins and minerals. 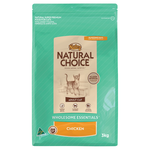 Nutro cat food is preserved naturally using a unique mixture of rosemary extract with tocopherols (vitamin E), and contains no artificial colours, flavours or preservatives. Nutro cat food is specially designed with ingredients from nature that encourage healthy attributes in your cat such as healthy joints, a shiny coat, and smaller, firmer stools with less odour. Feedback often received from customers who buy and review Nutro cat food is that their cats love the delicious taste! For assurance, if you or your cat are not completely satisfied with Nutro cat food, there is a 100% money back satisfaction guarantee. Nutro is made in Australia from locally sourced produce wherever possible. This helps to support local farmers and manufacturers, and means that due to no import or export time, it arrives to you as fresh as possible. The Nutro range provides complete and balanced nutrition for cats in all lifestages and lifestyles - including kitten, adult, and senior, as well as formulations for weight management and sensitive skin. Every Nutro cat food contains essential nutrients, vitamins, and minerals. Skin and coat health is supported with zinc and linoleic acid, digestion is aided with premium natural fibres, and the immune system is strengthened with the inclusion of advanced antioxidants.